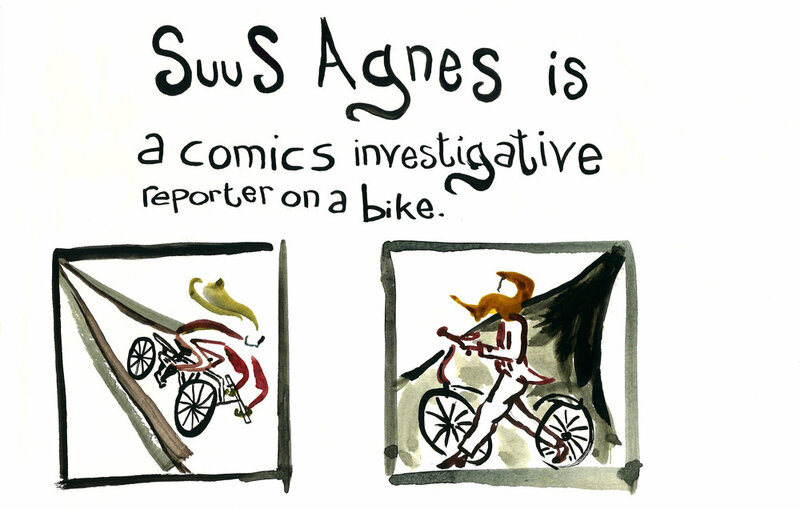 Suus Agnes is an author-illustrator and comics artist with a background in science communication, literary studies, and beekeeping. Her work takes a particular interest in environmental ethics and the underdog. She has been published in New Zealand, Australia and on online platforms, and exhibited in galleries and comics festivals locally and internationally, including in Russia, Canada, the UK and the Netherlands. Recent solo exhibitions and publications include “Connect: Ecological Comics”, Saint Petersburg, Russia, and "Parasite: Viewed With a Willing Eye", Dunedin, New Zealand. As a PhD candidate at the Centre for Sustainability at Otago University in New Zealand, she currently works on visual narratives about human relationships with 'unloved' microcommunities of invertebrates, moss, and fungi, and challenges the idea of humans at the center of the universe. I look for ways to better coexist with my environments through different ways of knowing them —from folklore and myth to traditional and contemporary ecological knowledges— and let these stories colour my daily observations and actions, as I’m learning to read my surroundings intimately; perhaps even communicate with them. Who am I to them? Who responds to the seeds and spores I spread? By engaging story and sense in processes of getting to know other beings, my creative practice seeks to bring them to wider cultural imaginations. It’s too easy to overlook or disregard them as backdrops to human life. By reviving forgotten wisdoms, I wish to contribute to a broader recognition of nonhumans in all shapes and sizes, not just for their importance and wondrousness, but also as life forms in their own rights, alive and aware, creatures full of story and for who things matter. I like to look for the outer boundaries of what constitutes a comic: my work breaks free from the perfect square panels. I love expressions that combine painting, poetry, and/or natural history as if they never needed to be separated — medieval miniatures, bestiaries, and early 20th century avant garde fire my imagination. The uncomfortable, the wondrous, the underdog. I'm interested in questions of self — never in isolation; always enabled by other creatures and earth processes. Then there are dreams, odd observations, the beauty in the mundane, and life’s absurdity.